Nicky Abbondanza, the famous theatre professor, is directing a movie “Tight End Scream Queen” at a college’s fraternity football house in Treemeadow. But when young football players start to be killed on set, Nicky has a new mystery and murderer to arrest. Like usual, his husband Noah, their son Taavi and their friends Martin and Ruben are with him for these new adventures, as well for the film and for the crime. 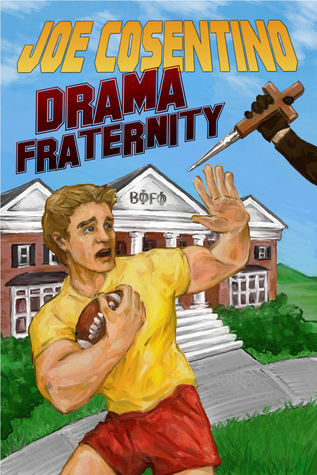 Drama Fraternity is book 6 in Nicky and Noah mysteries series. Nicky, Noah and the gang are back for our great pleasure. After their immense success in New York, they decide to come back to live in their small town, Treemeadow. Nicky agrees to direct a movie, even if he knows it won’t be a success, but of course, because we talk of Nicky and Noah, it can’t be a peaceful production and a murderer is in action. I had great pleasure with this book. The author has regaled us with this new episode in the Nicky and Noah’s mystery show. The plot is simple, a team, a murderer, and Nicky and Noah trying to solve the mystery. What’s fabulous with this book, is how the story is written, how the tale is told to us. What I loved the most in this book? The author’s style. Each scene in the book is a show by itself, like a Vaudeville, we can see in one scene, three different actions, I love it. It put a lot of dynamics into the plot. Nicky is our guide in this new show, between the interactions with us, the reader, and his part to play, he gives us some amazingly funny situations with his big mouth and his crazy mind, and he makes me laughed a looooot. The author pleases us with a brilliant, funny text full of sassy references to our actuality, and behind all of this, he gives us beautiful messages. I highly recommend this book, and the entire series, it’s a pure pleasure, full of fun and love written with talent and brio (and it’s NOT an alternative fact). 5 OptimuMMs for the best modern Sherlock and Watson in books today.